I love chocolate. And peanut butter. Chocolate and peanut butter together. Whoever this Reese person is, I applaud him/her and the inspiration that is Peanut Butter Cups. Hands down, though, AMERICAN Reese’s peanut butter anything beat those found in Canada. It’s a fact. I have years of anecdotal evidence to support this claim. Not sure what it is, probably looser FDA approval processes or something, but those are so good. Recently, I learned via Twitter that in addition to peanut cups and Easter eggs, PB Pumpkins exist. 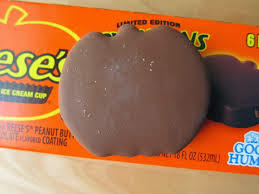 Peanut butter and chocolate deliciousness wrapped up in the shape of a pumpkin. Be still my heart. If you happen to be the recipient of such plastic-wrapped delactabilityness, there are some things you need to know. First of all, it’s best if no one else knows it’s in the house, but if that’s not possible, then never open one when small children are around. Or if you do, have decoy candy on hand. Oh, you don’t want this. Here, have some old jellybeans instead, aren’t they yummy? The fact that it doesn’t look like a pumpkin is irrelevant. Who are we to criticize Reese? Second, a treat like this needs to be savoured so wait for the right time. Brew some coffee (if it’s nap time) or pour yourself a class of wine. Light some candles, put on some music. It’s okay to wear yoga pants, PB Pumpkin doesn’t judge. 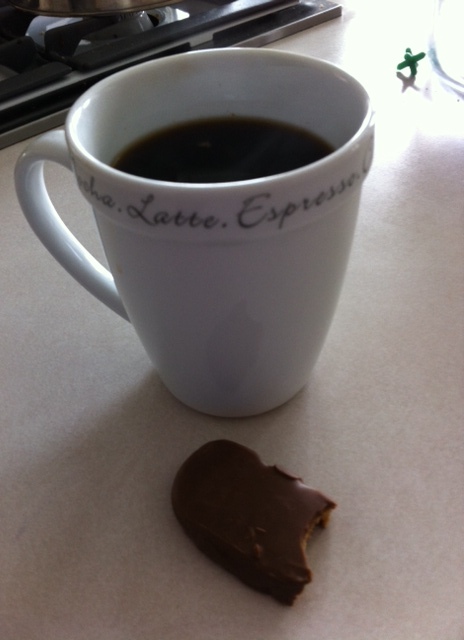 Coffee and PB are second only to wine and PB. Third, take your time. Even though those little pumpkins are more than half your daily fat allowance, they are small. Take a moment to enjoy each little bite. When you finish one, there’s a bit of let down. That’s when the second one comes in handy. It also helps if you tell yourself that the second one is the last one and then surprise yourself and crack open the third. It’s the best, right? Hands down. You didn’t know about the pumpkins? There are also Christmas trees which do not help me honor the birth of Christ (except as creator of peanut butter and chocolate) but they do make me happy which is important during busy holidays for the children’s sake. It’s for the children, really. I’ll send you my mailing address for when the Christmas trees are in stock. Sure, but I’ll also have to send you the cookies with the peanut butter cups in them. So good. Just when I thought they could not be improved upon. You got some! You got some! I’m so happy for you! And “It also helps if you tell yourself that the second one is the last one and then surprise yourself and crack open the third.” … Well, that’s just natural. Yes. We all do that. RIGHT? I thought it was obvious, too. But worth sharing, just in case. Reese cups are my absolute favorites! I work in a drug store, so I see all the different shapes each season and, man, is it a constant temptation not to take my check in Reese cups. If I ever come visit, I’ll be sure to bring you loads of American Reese’s! I long for the day. They showed up about a month ago here. I’ve been eating them for a few weeks now. I’m now looking at job opportunities across the border. I feel like I just came out. Please be nice. I can still be your friend, just give me time to process this. I need to find new friends. I’ll hook you up with my next delivery.